Thank you, Dr. Fox. When the PTSA invited me to speak to you last month, I had just turned 25, so your invitation officially ushered in my quarter-life crisis. For the first time in years, I dreamt about taking my AP exams again. I felt like I was returning for a pop quiz on my life. What have I done in the seven years since graduation? Of all the distinguished alumni, all the successful doctors, lawyers, and businessmen, why ask an aspiring filmmaker--a self-proclaimed "starving artist"--to address Esperanza's best and brightest? It hasn't been long since I was in your shoes. Seven years ago, I sat in those same seats, fidgeting with my tie and crossing items off a checklist in my head. The night was young, and I still had much to do: Spanish vocab to memorize, prom plans to confirm, thespian initiation week, and an impending two-day calculus final. Not to mention those permanently uncheckable items: praying I kept my grades up so Stanford would still take me in the fall. The weight of parental expectation. And the huge question of the future. College. What came next. I know the road to this point wasn't easy. Like you, I sacrificed a great deal to make the grades, to sit in that seat. Eight classes a day on alternating sides of the bridge, NHS and CSF meetings, Creative Impulse deadlines, drama rehearsals, then a pile of homework and six hours of sleep or less before I woke up to do it all over again. On weekends, I wrote college essays and studied for the SAT. I traveled to debate tournaments. And dealt with my share of high school drama: fall outs with friends, parental spats, the zit-inducing terror of dating. What would I have told my 18-year-old self? As a student sitting in your seat, what would I have wanted to hear? Though I haven't lived long enough to give you life's big picture, I can offer you a glimpse into the years ahead and share some of the insights I've gathered along the way. One question I'm often asked--a question I ask myself from time to time--is "Was it worth it?" Was college worth four years of stressful all-nighters? Was it worth a high school experience more Glee than Gossip Girl? If I found myself back in ninth grade, would I choose the same path? I still remember my first trip down Palm Drive, the main entrance to Stanford's campus. It's a dense, mile-long road lined by towering palm trees that completely obscure campus. Until you reach the Oval. Then the road opens to reveal a stunning vista of red-roofed, sandstone buildings and the golden face of Memorial Church, set against a backdrop of sprawling foothills. It kicked the breath out of me. Stanford. I'd spent my high school career traveling down this road, slogging through research papers and DBQs, hoping my hard work would pay off. And in the end, those sacrifices led me to an intellectual paradise I'd call home for the next four years. Four years that spread like Stanford's campus before me, to be made into whatever I wanted. Was it worth it? You bet it was worth it. The novels you read, the supply and demand curves you drew, the Immex modules and Wordly Wise assignments you completed were worth it. The time you spent curled up with your graphing calculator was worth it. Let me give you an idea of the mind-blowing college experience that awaits you. Freshman year, you take a seminar with David Kennedy, author of your AP US History textbook. In Psych One, you discover that half the psychologists you've been studying have offices in the building. Your English department attracts writers like J.M. Coetzee, Joyce Carol Oates, and Annie Proulx. Graduates from your school have founded Google, Yahoo!, and Hewlett-Packard. Opportunity is as abundant as the palm trees. Genius wears flip-flops and a t-shirt. And instead of taking mandatory, Honors track classes, you're free to pursue your intellectual passions, whether it be collaborating on a 250-page graphic novel or designing the next killer iPhone app. Freshman year, I lived with a ballet dancer from New York, a mathematician from Michigan, and a medic from Hong Kong. My friend Jack was a history major from El Paso, and if you gave him any number from 1 to 44, he could tell you the US president. Swapping late-night stories in the dorm hallway, I realized just how sheltered my life had been. You've proven yourselves to be the top students here at Esperanza, but the world is much bigger than Yorba Linda, than this school. Let your classmates' perspectives challenge and enrich you. What you learn from them will be just as valuable as what you learn in class. Like my friends, I too became distinguishable by my passions. Instead of being known as the smartest kid in class, I was known as a writer and filmmaker. My dormmates became my enthusiastic acting troupe. They crewed my film shoots, read parts in my staged readings, and even performed an interpretive dance I wrote to celebrate the end of daylight savings. These early dorm projects soon led to more professional productions. As a junior, I wrote and directed MODEL MAN, a film about a female Pygmalion who constructs a wind-up robot. Stanford grant money allowed me to hire Bay Area actors and rent professional video equipment to boost the film's production value. Now let me tell you a little secret: I'd never produced a film on that scale before. Applying for grants, securing locations permits, and planning a three-day film shoot were all new to me. I learned how to make a film by making that film. Stanford provided me with countless other opportunities for which I was not strictly qualified. The summer after my freshman year, I worked at the California First Amendment Coalition, a nonprofit organization promoting free speech and open government. As a sophomore, I taught fellow undergrads in Psych One discussion sections. I studied abroad at Oxford, where my English tutor required me to write a 10-page research paper on a new novel every week. And for my senior honors thesis, I completed three drafts of ENCANTADO, my first novel. These experiences taught me that you should do everything before you're ready. Don't let self-doubt or fear of failure prevent you from taking opportunities that may seem out of reach. In many cases, the most important qualification is a willingness to learn. It's what my boss calls "being a stem cell": position yourself beyond your abilities, then grow into the role. Even if you don't succeed, you'll learn how to do it better the next time around. I'm all about efficiency, and a steep learning curve is the most productive way to learn. It means you'll gain a ton of experience in no time at all. When I graduated from Stanford, a mentor suggested I submit a documentary to Current TV, an award-winning cable news channel and website. In the fall of 2007, Current was looking for human stories that addressed important election issues. Though I'd never made a documentary before, I submitted a piece, and the next thing I know, Current was flying me out to New Hampshire to cover the presidential primary. I found myself at Nashua town halls and Manchester meet and greets, chasing presidential hopefuls across snow-covered highways. My job was to keep candidates talking about the issues: US power, consumption, the economy, and the role of government. In that whirlwind week, I learned to appreciate the power of documentary journalism: how my coverage allowed viewers to access the primary through the eyes of someone their age, and how documentary filmmaking in particular bridged the divide between personal and political, illustrating the very real impact of government policies in people's lives. My experience at the primary also drew on many of the interests and skills I began developing in high school. It was a chance to see, in action, the electoral process I read about in Mr. Matthews' government class. It was an opportunity to employ journalistic skills I honed while editing the newspaper with Ms. Cummings. 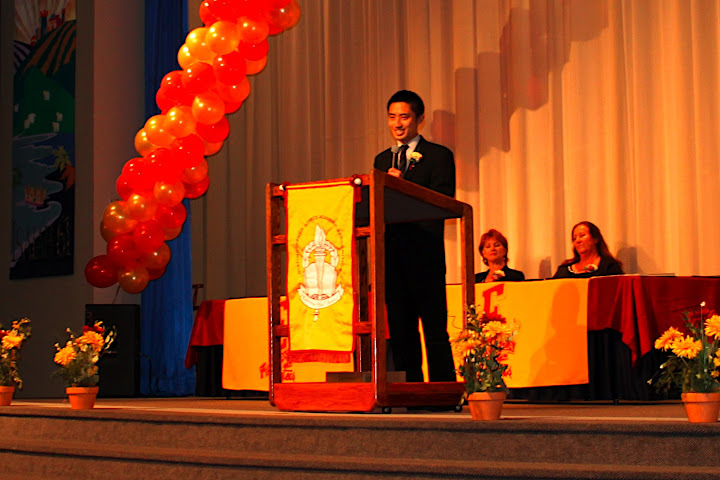 Four years of debate and drama enabled me to speak eloquently in front of the camera. US history with Mrs. Amann gave me an awareness of the historical moment. Which is all to say that education is never passive. It's never sitting at a desk with a book pressed to your head. It's more like a dinner party, absorbing other's ideas so you have enough context to add your own voice to the mix. Hunger for new knowledge will keep you relevant. Openness to new perspectives will keep you young. Congratulations on all you've done and all you've yet to do. I look forward to hearing great things from you, my fellow overachievers. Thank you. beautifully written and so inspiring, steven! 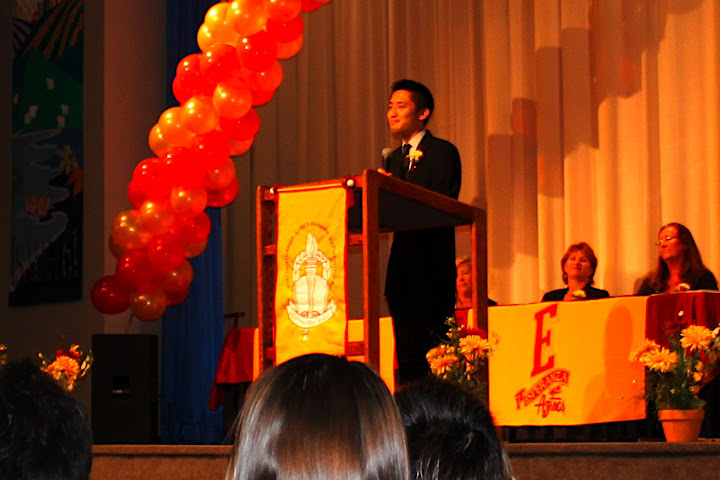 how awesome was it to speak at your high school with so many accomplishments under your belt at your age!